5 portions vegetables and fruits are the best to provide your body with all he need for a strong healthiness. I start to work with these rates a few years ago and optimized my vegetable consumption a lot and the results are amazing! Smoothies are such a great way to integrate more veggies! I feel really better since I changed my diet and I meet a lot of people who have a lot afflictions like flatulence or stomachache. I am really sure they could avoid many of these afflictions by changing their diet. When I was a child I ate so many sweets and fast food, drank a lot of cola and my dietary habits were so confused. That was the reason why I was ill every week and looked like a ghost. My skin wasn’t healthy and my hair really dry. I don’t slept well and I can’t concentrate myself very good. Everybody needs to make his own experiences to realize what’s good for him and what not. The most important thing is to hear to the own body, he tell us what he need. I like to talk more about my lifestyle and how I changed my lifestyle in the last years. I will let you know what I’m doing to feel better. But first I like to share this creamy red beet recipe with you and inform you about the health benefit. 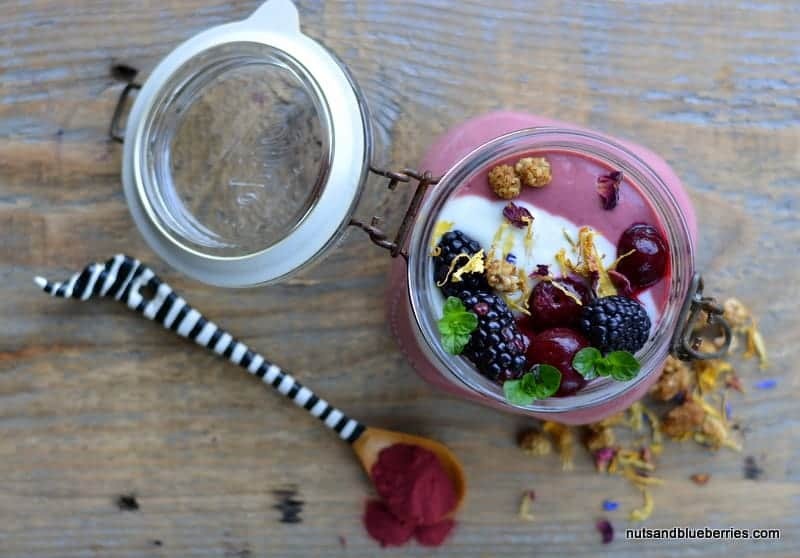 I don’t like a water consistency in my smoothies so I add soaked nuts, oats or yoghurt to make it more creamy. My smoothies are often my breakfast, it need to keeps me full until lunch time. I really use a lot of fresh fruits and vegetables but sometimes I haven’t something at home or the things I need haven’t season. That’s the time I use pulverized versions like red beet powder. In that way I don’t need to miss the health benefits of the amazing vegetables and fruits. Most of the time vegetables. Red beet is one of the healthiest food in the world! Beets are a unique source of phytonutrients called betanin. Betanin is antioxidant, anti-inflammatory and detoxifying. Full packed with vitamins like vitamin B1, B2 and B6 as well as vitamin C red beet is a perfect source for pure healthiness. Mix all together in a high speed blender and top with yoghurt and fresh friuts.